I recently announced my pregnancy on Instagram with a half marathon finish line photo! With my second baby (in just 20 months) due in May, I’m doing my best to balance motherhood, work, and fitness. During my first pregnancy, I promised myself to be as active as possible and managed to run until the day before my induction! Granted, that last run was short, slow, and included lots of walk breaks…but I exceeded all my expectations by staying active until the bitter end! This time around, I’m hoping for a similar journey. Running through pregnancy left me feeling fit and empowered, and helped feel more connected to my changing body. Every mom-to-be has a different journey, but today I’m sharing five tips to help you keep up your running routine throughout pregnancy! Your body is working that much harder while you are growing a baby, and you can’t expect running to be easy throughout the journey. You’ll likely find that running fast feels hard as early as the beginning of the first trimester. While it’s still okay to push a little during pregnancy, you shouldn’t be chasing PR’s. Switch from running by pace to running by feel. A good rule of thumb is to run at a conversational pace. You should be able to spit out a few words with each breath. That way, you’re still getting a good workout but you aren’t overworking your body. During pregnancy, blood and plasma volume increase by as much as 50% -- after all, you’re growing another human! This means your heart is working harder to pump all that blood, and you’ll likely heat up faster and sweat more. You need to make sure you stay extra hydrated if you’re engaging in regular exercise. Buying a hydration belt or backpack or a handheld water bottle can help you stay hydrated on the go, and products Nuun Hydration tablets can give you an extra boost of electrolytes without empty calories. You know your belly is going to grow, and there are a wide variety of maternity support belts available for active moms-to-be! Even if your bump is still tiny, a support belt can take some pressure off as your center of gravity shifts forward. Don’t forget to treat yourself to new sports bras if yours start to feel tight, too! I also benefitted from more supportive running shoes during pregnancy, since my body was carrying extra weight. For me, there were two factors that made my routes ideal: restrooms at regular intervals (every 1-2 miles), and no hills. This was especially important during the third trimester, when baby really started pushing on my bladder! 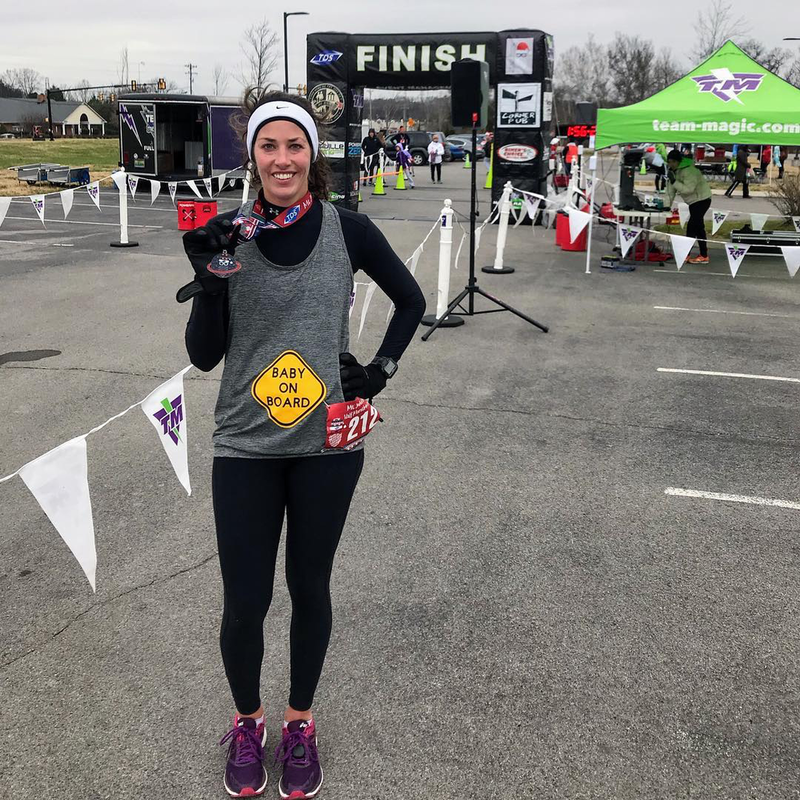 Running big hills really made my heart rate spike, so I chose to run flat courses as my pregnancy progressed, or planned to walk the hills I knew I would encounter. Every woman is different. Every pregnancy is different. Running during pregnancy should leave you feeling good, but not exhausted, overly sore, or in all-out pain! Some ladies can run 6-minute miles at 40 weeks; others switch to slow, short, run-walk intervals at the beginning of pregnancy. No matter what category you fall into, don’t compare yourself with others. Do your best to stay active, and whether you run, lift, do yoga, walk, or swim, remember that your body is doing something amazing!